A metagenomic library was prepared using pCC2FOS vector containing about 3.0 Gbp of community DNA from the microbial assemblage of activated sludge. Screening of a part of the un-amplified library resulted in the finding of 1 unique lipolytic clone capable of hydrolyzing tributyrin, in which an esterase gene was identified. This esterase/lipase gene consists of 834 bp and encodes a polypeptide (designated EstAS) of 277 amino acid residuals with a molecular mass of 31 kDa. Sequence analysis indicated that it showed 33% and 31% amino acid identity to esterase/lipase from Gemmata obscuriglobus UQM 2246 (ZP_02733109) and Yarrowia lipolytica CLIB122 (XP_504639), respectively; and several conserved regions were identified, including the putative active site, HSMGG, a catalytic triad (Ser92, His125 and Asp216) and a LHYFRG conserved motif. The EstAS was overexpressed, purified and shown to hydrolyse p-nitrophenyl (NP) esters of fatty acids with short chain lengths (≤ C8). This EstAS had optimal temperature and pH at 35°C and 9.0, respectively, by hydrolysis of p-NP hexanoate. It also exhibited the same level of stability over wide temperature and pH ranges and in the presence of metal ions or detergents. The high level of stability of esterase EstAS with its unique substrate specificities make itself highly useful for biotechnological applications. Lipolytic enzymes such as esterases (EC3.1.1.1) and lipases (EC3.1.1.3) catalyze both the fat hydrolysis and the synthesis of fatty acid esters including acylglycerides as biocatalysts . Lipolytic enzymes are ubiquitous α/β hydrolyzing enzymes existed in animals, plants, and microbes, including fungi and bacteria. Microbial esterases are showing considerable industrial potential where their regiospecificity and enantioselectivity are desired characteristics , such as production of fine chemicals, pharmaceuticals, in the food industry and are widely used in biotechnology [2–4]. Modern biotechnology has a steadily increasing demand for novel biocatalysts, thereby prompting the development of novel experimental approaches to find and identify novel biocatalyst-encoding genes. Metagenome is the total microbial genome directly isolated from natural environments, and the power of metagenomics is the access, without prior sequence information, to the so far uncultured majority, which is estimated to be more than 99% of the prokaryotic organisms [5–7]. In fact, the metagenomic approach was successful in searching for novel lipolytic enzymes in varied environments, and also, several genes encoding metagenomic esterases have been identified in metagenomic libraries prepared from varied environmental samples, including soils [6–9], marine sediment [10–12], pond and lake water [13–15], and tidal flat sediment . Studies based on 16S rDNA library have extensively redefined and expanded our knowledge of microbial diversity in activated sludge from low-temperature aromatic wastewater treatment bioreactor, including members of various un-culturable groups (unpublished data). To the best of our knowledge, activated sludge microbial communities have not been exploited by culture-independent methods for isolation of lipolytic genes. Here, we report the isolation, sequence analysis, and enzymatic characterization of a novel esterase, EstAS, from an activated sludge derived metagenomic library. The discovery of EstAS led to the identification of a new family of bacterial lipolytic enzymes. Activated sludge was collected from a low temperature sequencing batch bioreactor (SBR) treating nitrogen-containing aromatic wastewater in our laboratory. The starting strains and plasmids used in this study are listed in Table 1. E. coli was grown at 37°C in Luria-Bertani (LB) medium supplemented with appropriate antibiotics , at 12.5 μg/ml for chloramphenical, 100 μg/ml for ampicillin and 25 μg/ml for kanamycin. Apr, ampicillin resistant; Cmr, chloramphenicol resistant; Kmr, kanamycin resistant. E. coli cells were transformed by the calcium chloride procedure . Recombinant plasmid DNA was isolated by the method of Birnboim and Doly  or with a Tian-prep Mini kit (TianGen). Restriction enzymes, T4 DNA ligase and calf intestinal alkaline phosphatases were purchased from New England Biolabs (Ipswich, USA) or Takara (Tokyo, Japan) and used according to the manufacturers' instructions. Activated sludge DNA extraction was carried out using SDS and proteinase K treatment , and the removal of humic acids (HAs) prior to DNA extraction was conducted by using HAs removing buffer . Approximately 100 μg of metagenomic DNA was run on a preparative pulsed-field gel (Bio-Rad CHEF DR®III; 0.1-40 s switch time, 6 V/cm, 0.5 × TBE buffer, 120° included angle, 16 h), and the appropriate size of DNA ranging from 30-50 kb was isolated, electroeluted, and dialyzed against 0.5 × TE buffer for further Fosmid library construction. The purified DNA fragments were end-repaired by End-repaired enzyme mix. After size fractionation and purification, the blunt-ended, 5'-phosphorylated DNA was ligated into the cloning-ready Copycontrol pCC2FOS vector, and the recombinant molecules were packaged in vitro with a MaxPlaxTM Lambda packaging kit (Epicentre Biotechnologies, Madison, Wisconsin, USA). The selected unique fosmid clone was named FosB12L1 (showing strong lipolytic activity on tributyrin plate), and purified, partially digested with Sau 3AI to obtain 3-5 kb size DNA, and ligated into a purified Bam HI/BAP pUC118 vector from Takara. Ligation products were transformed into E. coli TOP10 cells (Tiangen) and spread out on LB (ampicillin, 100 μg/ml) plates containing 1% (v/v) tributyrin as the indicator substrate . The DNA fragment obtained was sequenced with primer walking method by SinoGenoMax Co. Ltd (Chinese National Human Genome Center, Beijing). The ORFs were analyzed using DNAstar (Lynnon Biosoft) and GeneTool software (Syngene), Database searches were performed with the BLAST program via GenomeNet World Wide Web server. Peptide sequences of various enzymes or subunits were extracted from National Center for Biotechnology Information (Washington, D.C). Deduced amino acid sequences of 8 lipolytic enzymes were subjected to protein phylogenetic analysis. Sequence alignment was performed by using CLUSTAL_W program  and visually examined with BoxShade Server program. Phylogenetic tree was generated using the neighbor joining method of Saitou and Nei  with MEGA 4.0 software . For the overexpression of EstAS, the full length of the estAS gene was amplified using primers EstAS-f and EstAS-r (Table 2) and high fidelity PrimeSTAR™HS DNA Polymerase (code: DR010SA, Takara). The primer pairs with restriction enzyme sites (underlined) for Hind III and Nde I were designed to generate an N-terminal His-tag of the recombinant esterase. The integrity of the nucleotide sequence of all newly constructed plasmids was confirmed by DNA sequencing. The EstAS gene was cloned into an expression vector, pET28a(+), and the recombinant plasmid pEstAS-His was transformed into E. coli BL21 (DE3) cells. When the cell density at 600 nm reached around 0.6, 1 mM isopropylthio-β-D-galactoside was added for the induction, following a further cultivation for 4 h at 30°C. Then cells were harvested by centrifugation, resuspended in a 50 mM sodium phosphate buffer (pH 8.0) containing 10 mM imidazole, and disrupted by sonication. The protein was applied to metal-chelating chromatography using Ni-NTA affinity chromatography (Novagen) according to the manufacturer's instructions. SDS polyacrylamide gel electrophoresis was carried out according to Sambrook and Russell . The substrate specificity of the purified enzyme was analyzed using the following substrates of p-NP-fatty acyl esters [21, 25]: acetate (C2), butyrate (C4), hexanoate (C6), caprylate (C8), decanonate (C10), laurate (C12), myristate (C14) and palmitate (C16). The enzyme was incubated with the ester derivatives (0.5 mM) in 5 ml Tris-HCl buffer (50 mM, pH 8.0) at 40°C for 10 min. The reaction was quenched by adding 5 ml trichloroacetic acid (0.5 mM) and then recovered the original pH value with 5.15 ml NaOH (0.5 mM), and the amount of released p-NP was determined by an absorption increase at 405 nm against an enzyme-free blank on a Biospec-1601 spectrophotometer [26, 27]. One unit of esterase is defined as the amount needed to release 1 μmol p-NP per min under the above conditions. The highest enzyme activity on a substrate (i. e. p-NP-hexanoate) was defined as 100%. To determine the presence of esterase activity, the triglyceride derivative 1,2-di-O-lauryl-rac-glycero-3-glutaric acid 6'-methylresorufin ester (DGGR) (Sigma Aldrich) was used as a chromogenic substrate, and the formation of methyresorufin was analyzed spectrophotometrically at 580 nm [1, 28, 29]. Candida rugosa lipase (Sigma Aldrich) was used as a positive control. Using p-NP-hexanoate (0.5 mM) as substrate, the optimal temperature and pH of purified EstAS was determined, by measuring the enzyme activity after incubation at various temperatures (10-65°C) in 50 mM Tris-HCl buffer (pH 8.0) or after incubation at 35°C for 10 min in the following buffers: 50 mM phosphate buffer (pH 5.0-7.5), 50 mM Tris-HCl (pH 8.0-10.5). Various metal ions (CoCl2, CaCl2, ZnCl2, MgCl2, K2SO4, FeSO4, CuSO4, Ni(NO3)2 and MnSO4), and chelating agent EDTA at final concentration of 1 mM were added to the enzyme in 50 mM Tris-HCl (pH 8.0), then assayed for esterase activity after preincubation at 35°C. Effect of detergents or reductors on esterase activity was determined by incubating the enzyme for 30 min at 35°C in 50 mM Tris-HCl (pH 8.0), containing (1%, v/v) Triton X-100, Tween 20 and 80, β-mercaptoethanol, 1, 4-dithiothreitol (DTT), sodium dodecyl sulfate (SDS), cetyltrimethyl ammonium bromide (CTAB), phenylmethanesulfonyl fluoride (PMSF) and diethypyrocarbonate (DEPC), respectively. The enzyme activity without metal ions and detergents was defined as 100%. The DNA sequence of EstAS was deposited in DDBJ/EMBL/GenBank under accession number of FJ386490. About 100 μg DNA was extracted from 1 g activated sludge (wet-weight), and 1.5 μg of size-selected, pulse-field gel-purified high-molecular-weight (HMW) DNA suitable for fosmid cloning was obtained. 300 ng of 30-45 kb purified metagenomic DNA was ligated into the copy control pCC2FOS vector and transfected into E. coli EPI300-T1R, producing a metagenomic library of more than 100, 000 fosmids with insert sizes ranging from 28 kb to 40 kb (average size of 35 kb), covering approximately 3.0 Gbp of the total metagenomic DNA. The prokaryotic origin of the library was confirmed by end-sequencing of randomly selected fosmids and comparison with known ORFs in NCBI. Expression screening of the fosmid library based on the hydrolysis of emulsified tributyrin (1%) resulted in the detection of a recombinant clone, FosB12L1, forming a clear zone on the indicator plate. The DNA insert (36 kb) of fosmid B12L1 was partial digested by Sau 3AI and subcloned into pUC118, producing a subclone library of more than 3,000 clones with an average insert size of 3-5 kb. 300 subclones were screened for lipolytic activity. One subclone expressing extracellular lipase/esterase activity was sequenced and assembled into a contig of 3780 bp (data not shown). An ORF of 834 bp encoding a putative lipase/esterase (named EstAS) of 277 amino acid residuals was identified. Amino acid sequence alignment indicated that this EstAS showed quite low identity with other esterase/lipases, highest with the esterase/lipase from Gemmata obscuriglobus UQM 2246 (ZP_02733109, 33% identity), followed by the lipase from Yarrowia lipolytica CLIB122 (XP_504639, 31% identity), the putative lipase/esterase from Magnaporthe grisea 70-15 and Saccharomyces cerevisiase Tg12p (XP_368471, 31% identity; and NP_010343, 29% identity, respectively), members of the family of fungal hydrolases. And also, the EstAS contained a catalytic triad (Ser92, His125, and Asp249) and a LHYFRG conserved motif (starting from His36), as shown in Fig. 1, which is in close proximity to the active site contributing to the formation of the oxyanion hole that is likely to participate directly in the catalytic process [2, 30, 31]. Furthermore, to clarify the phylogenetic relationship of the EstAS with other esterases or lipases, a neighbour joining tree was constructed using the amino acid sequence, as shown in Fig. 2. In this tree, EstAS is located closest to the branch of esterase/lipase (accession number X53053) of strain Moraxella sp. TA144, and also Streptomyces sp. M11, Streptomyces albus G (accession numbers M86351 and U03114, respectively), which constitute family III lipases. This result might suggest that the EstAS is a new member of family III lipases. Conserved sequence blocks from multiple sequence alignment of EstAS from activated sludge metagenomic library and other related proteins. Sequence alignment was carried out with CLUSTAL_W  and BoxShade Server http://www.ch.embnet.org/software/BOX_form.html. XP_504639, esterase/lipase from Yarrowia lipolytica CLIB122; XP_368471, LipA from Magnaporthe grisea 70-15; NP_010343, esterase/lipase from Saccharomyces cerevisiae Tg12p; ZP_02733109, lipase from Gemmata obscuriglobus UQM 2246. Phylogenetic analysis of EstAS and closely related proteins. Phylogenetic analysis was performed using the program MEGA 4.0. Except for EstAS, the protein sequences for previously bacterial lipolytic enzymes were retrieved from GenBank http://www.ncbi.nlm.nih.gov. The numbers at node indicate the bootstrap percentages of 1000 resamples. To investigate the property of this EstAS, EstAS gene was expressed as an N-terminal His-tag fusion protein using pET-28a(+) expression system in E. coli BL21(DE3). 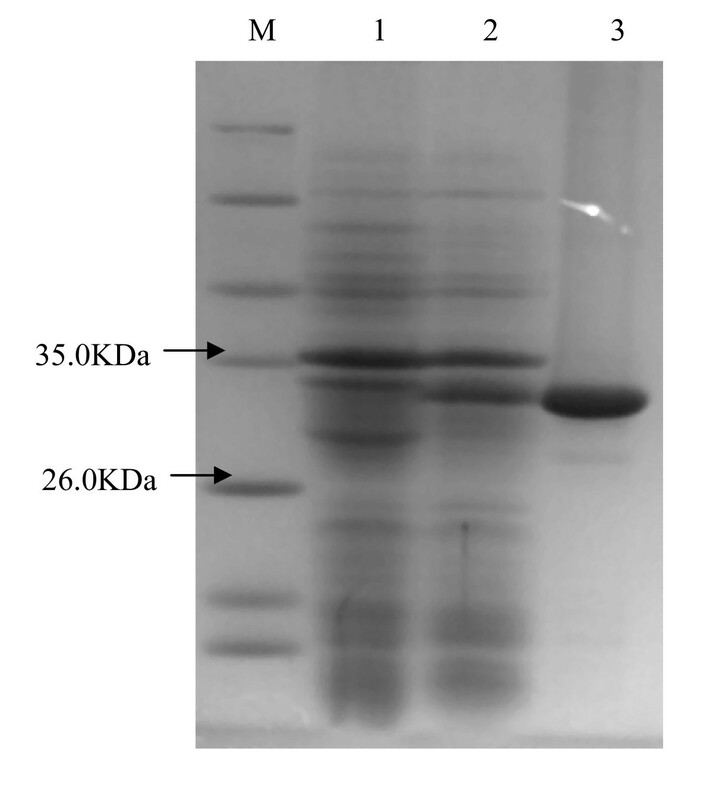 SDS-PAGE analysis of the purified EstAS showed a single band corresponding to about 31 kDa (Fig. 3), quite agreement with the predicted full length of EstAS. The purity of the purified protein was more than 98% according to SDS-PAGE analysis. SDS-PAGE of overexpressed esterase EstAS in E. coli. Lane 1: molecular weight protein marker (Tiangen, Cat. No: MP102); lane 2, E. coli/pET28a: total protein extract, as negative control; lane 3: induced culture of E. coli/pEstAS-His, total protein extract; lane 4: purified EstAS (31 kDa). We expressed EstAS as a hexahistidine-tagged (His-tagged) protein and investigated its chain length specificity using p-nitrophenyl esters (Sigma). EstAS showed high activity towards short-chain fatty acids (C4, C6 and C8), while much lower towards long-chain fatty acids (>C8) (Fig. 4). In addition, EstAS showed no fluorescence on olive oil plates with rhodamine B. Moreover, the EstAS was not able to hydrolyse DGGR (data not shown), while the lipase from Candida rugosa (used as a positive control) was able to hydrolyse DGGR to form chromogenic product, methylresorufin. These results indicate that EstAS is an esterase but a lipase [1, 25, 32, 33]. Substrate specificity of overexpressed and purified esterase. Relative activity was shown as the percentage of the activity towards 4-nitrophenyl hexanoate. All measurements were done in triplicate. C2, p-NP acetate; C4, p-NP butyrate; C6, p-NP hexanoate; C8, p-NP caprylate; C10, p-NP decanoate; C12, p-NP laurate; C14, p-NP myristate and C16, p-NP palmitate. 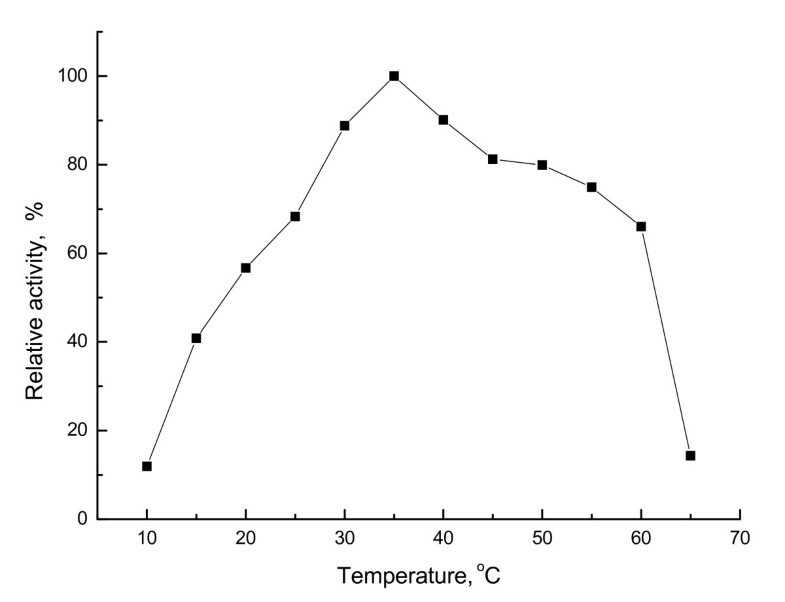 Purified esterase EstAS showed a broader temperature range (optimum at 35°C) than other original esterases, and retained over 65% activity at 60°C (Fig. 5). The esterase YlLip2 from Yarrowia lipolytica showed an optimum temperature at 40°C , however, it showed a poor thermostability since it lost activity just only incubation at 45°C for 4h. And also, the esterase EstAS showed activity in a rather broad pH range of 5.5-10.5. Maximal activity was observed at pH 9.0 and nearly 23% was still left at pH 10.5 (Fig. 6). Apparent temperature optimum of esterase EstAS. Relative activity of p-NP-hexanoate hydrolysis at different temperatures by purified EstAS. The activity was determined at different temperatures at pH 8.0 in 50 mM Tris-HCl buffer. The activity at 35°C was set as 100% (4760 U/ml). All measurements were done in triplicate. Effect of pH on the purified esterae EstAS. 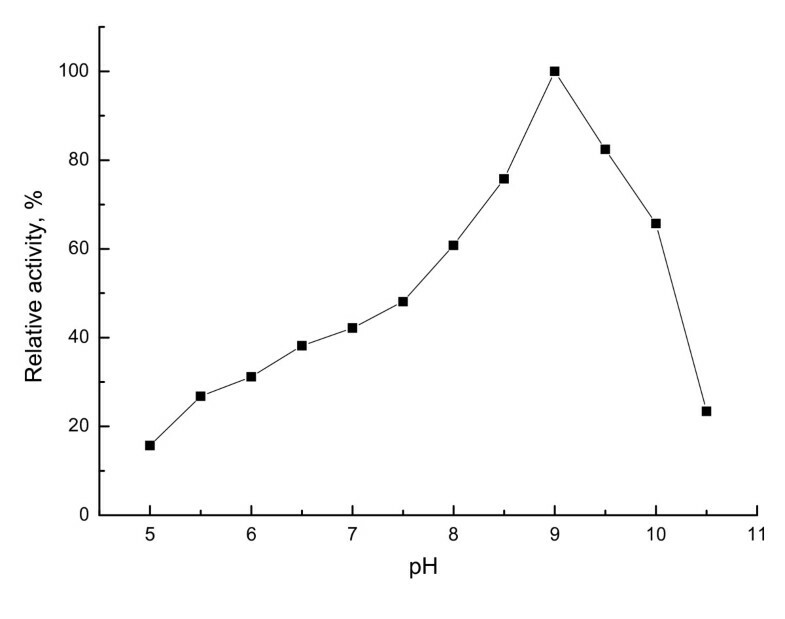 Relative activity of p-NP-hexanoate hydrolysis was performed in various pH buffers at 35°C (pH 5.0-7.5, 50 mM phosphate buffer; pH 8.0-10.0, 50 mM Tris-HCl buffer). The activity at pH 9.0 was set as 100% (4917 U/ml). All measurements were done in triplicate. The effect of metal ions on esterase EstAS activity is depicted in Table 3. Among metal ions tested, the activity was slightly increased by Co2+ (117%), Zn2+ (114%) and Fe2+ (103%), and strongly promoted by 1 mM Mn2+ (190%), in comparison with the control. However, it was a bit inhibited by Mg2+ and Ni2+ and almost totally inhibited by Cu2+ (7% residual activity). The fact that its activity was not affected by the chelating agent EDTA might suggest that this esterase is not a metalloenzyme. These results indicated that divalent metal ions, especially Mn2+, are necessary for the catalytic activity of esterase EstAS, similarly to metagenomic lipase LipG  and esterase EstA from marine metagenome . Therefore, manganese ions might carry out three distinct roles in esterase action: removal of fatty acids as insoluble Mn2+ salts in certain cases, direct enzyme activation acting as cofactor, and stabilizing effect on the enzyme. Activity without metal ions was set as 100% (5370 U/ml). All measurements were done in triplicate. The effects of detergents and reductors on esterase activity are shown in Table 4. A significant increase in lipolytic activity was observed with addition of 0.1% Tween 80 (128%), Tween 20 (135%), and 1 mM CTAB (138%), Triton X-100 (119%), after 0.5 h preincubation at 35°C. 1 mM β-mercaptoethanl, DTT did not affect the lipolytic activity (102% and 101%, respectively). However, DEPC and SDS had a strong inhibitory effect. In accordance with the esterase reported by Nawani et al. , a total loss of activity in the presence of SDS but an enhanced activity in the presence of Triton X-100, and Tween 20 and 80. Interesting, the esterase EstAS activity was not affected by 1 mM PMSF, suggesting it may possess a lid structure, which could eliminate the inhibition effect of PMSF, as some other esterases [10, 37, 38] and site-directed mutagenesis of amino acid Ser92 will be carried out to confirm the function of Ser92. Activity without detergents and enzyme inhibitors was set as 100% (5290 U/ml). All measurements were done in triplicate. In conclusion, we identified a new esterase EstAS belonging to family III lipases from SBR activated sludge metagenomic library. EstAS is a very interesting enzyme with high potential for downstream biotechnological applications. This was confirmed by extensive biochemical characterization, substrate specificity, stability towards addictives including metal ions and detergents, and also, wide pH and temperature spectra. This study also demonstrated that the metagenomic approach is very useful for expanding our knowledge of enzyme diversity, especially for bacterial esterases. Accessing the metagenomic pool of lipases and esterases can be an immediate source of novel biocatalysts, or yield enzymes that can be further specialized by directed evolution. Tao Zhang, Wen-Jun Han contributed equally to this work. This work was supported by grants of Hi-Tech Research and Development Program of China ("863" program, No. 2006AA06Z316) and the Knowledge Innovation Program of the Chinese Academy of Sciences, No. KJCX2-YW-L08 and KSCS2-YW-G-055-01. TZ participated in the design of experiments, and carried out the study and drafted the manuscript. WJH carried out the SDS-PAGE experiment and sequence alignment. ZPL conceived the study, and participated in its design and coordination and helped to draft the manuscript. All authors read and approved the final manuscript.